Not a fan of goopy, marshmallow covered sweet potato casseroles? Neither am I. This savory sweet potato casserole with apples and bacon is a delicious diversion from the candied stuff. This sliced sweet potato recipe is easy to make and can be doubled for larger crowds. Try my sliced sweet potato casserole for the holidays or anytime. This recipe has been updated for recipe and photos since its original publishing date in 2014. This sliced sweet potato recipe has several components. None are difficult, but you’ll want to have each component completed before you start assembling the savory sweet potato casserole. 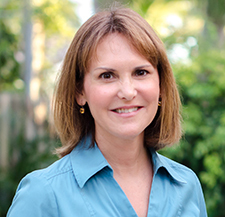 I usually bake my bacon in the oven – I find it easier and less messy than frying in a pan. Plus, while the bacon is cooking, I can get to work on the other components. (Directions for baked bacon in the notes section). Start by infusing the half and half with herbs and letting it reduce and thicken slightly. While the half and half is simmering, sauté the apples and nutmeg until they’re just softened, but not mushy. Peel and slice the sweet potatoes. You’ll want to get the slices as thin as you can. 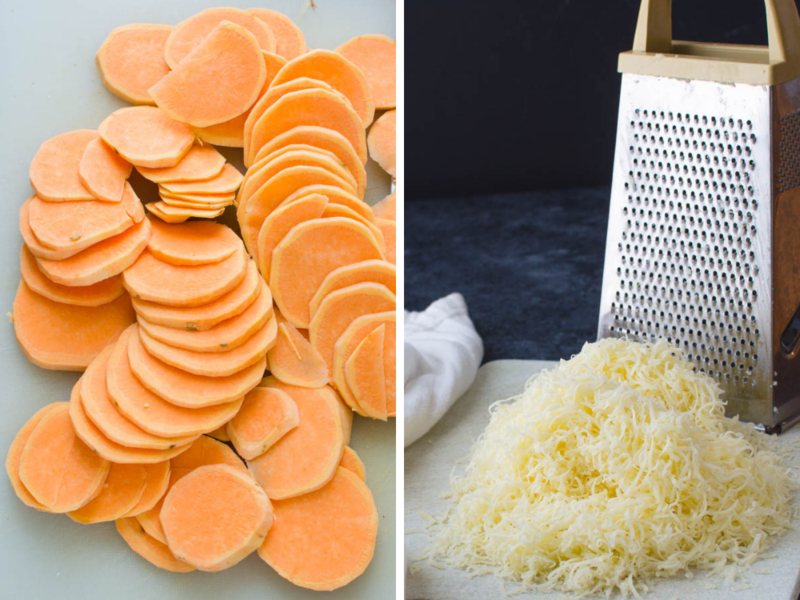 This can be done using the slicer attachment on a food processor, but if I’m honest, I think a sharp knife gets the best results for this sliced sweet potato recipe. Next is the cheese – gruyere — one of my favorites. This cheese is special. It’s got a nutty flavor and melts like a dream. If you can’t find gruyere, you can substitute emmenthal or swiss, but if you’ve got access to this, I’d splurge on it. Grate the using the fine grates on a box grater to get beautiful, fluffy mounds of cheese. Transfer about 1/3 to 1/2 cup of the hot cream mixture to a glass measuring cup with a spout. Rapidly whisk the eggs together. While whisking, pour the hot half and half into the center of the eggs in a slow steady stream. 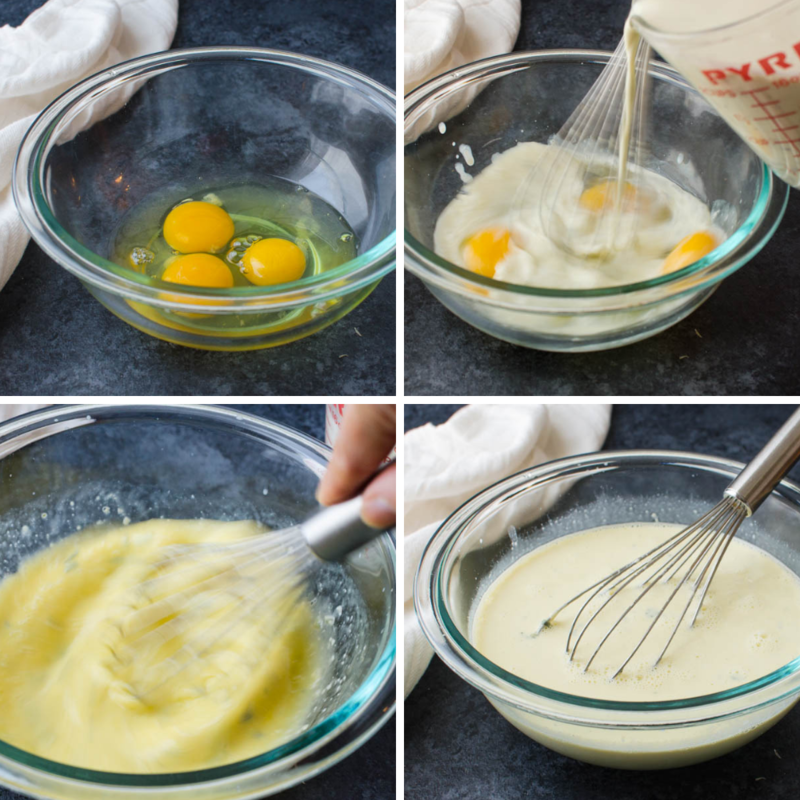 Once they are mixed together, the eggs are tempered (you’ve increased the temperature of the eggs slowly so that they become accustomed to the temperature without cooking) and you can continue to add the remainder of the half and half in a steady stream, whisking constantly. Spray the casserole dish with vegetable spray. Place 1/3 of the slices of sweet potatoes in the bottom of the dish, slightly overlapping (or shingling) them. Evenly spread half of the apples on top of the sweet potatoes. Top the apples with 1/3 of the cheese and 1/3 of the bacon. Drizzle 1/3 of the custard mixture over the casserole. 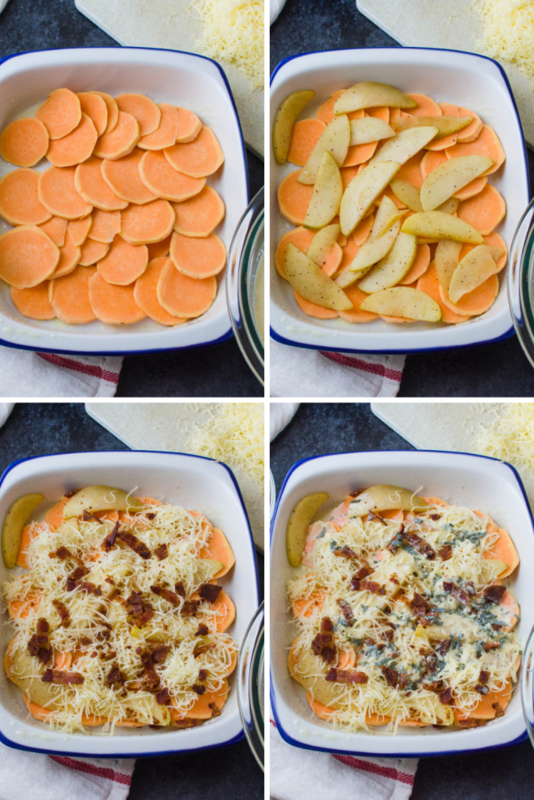 Do another layer in the same method: sliced sweet potatoes, apples, cheese, bacon and custard. The last layer is sweet potatoes and egg custard with a final sprinkle of cheese and bacon. 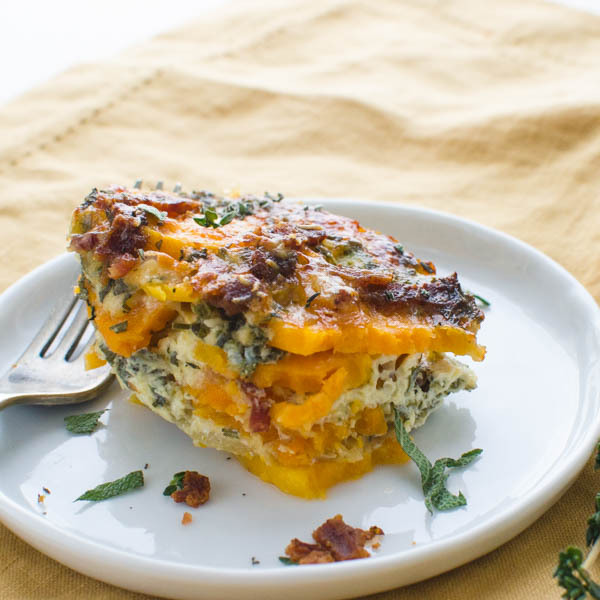 Cover the savory sweet potato casserole with tin foil and bake for 40 minutes. Then remove the foil and continue to cook for an additional 20 minutes or until the top of the sliced sweet potato casserole is golden brown and crusty. 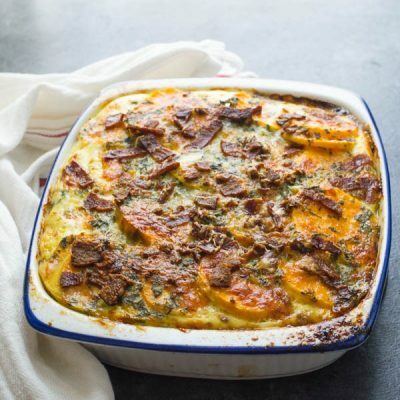 This sweet potato and apple casserole with bacon, cheese and herb infused custard is silky and flavorful. Unlike its marshmallow topped cousin, this sliced sweet potato recipe is more subtle in it’s flavors. Instead of a candy-bomb, the sweet potato and apple flavors meld beautifully with a bit of sweet and tart in each bite. They smokiness and crunch from the bacon adds great texture and, well — BACON. However, the most surprising part of this dish is the custard. It ties the whole dish together, but isn’t overly aggressive. To me, it acts more like a light binder for the rest of the ingredients. 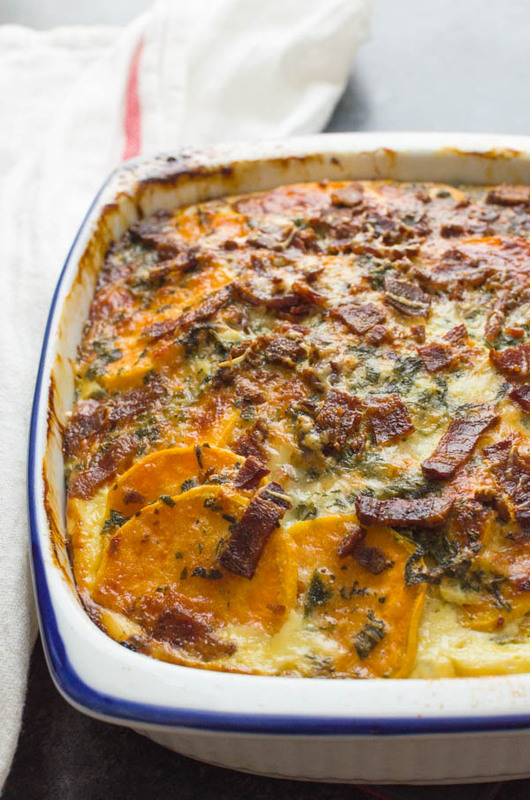 This savory sweet potato casserole is the real deal. Try it with your Thanksgiving Turkey. 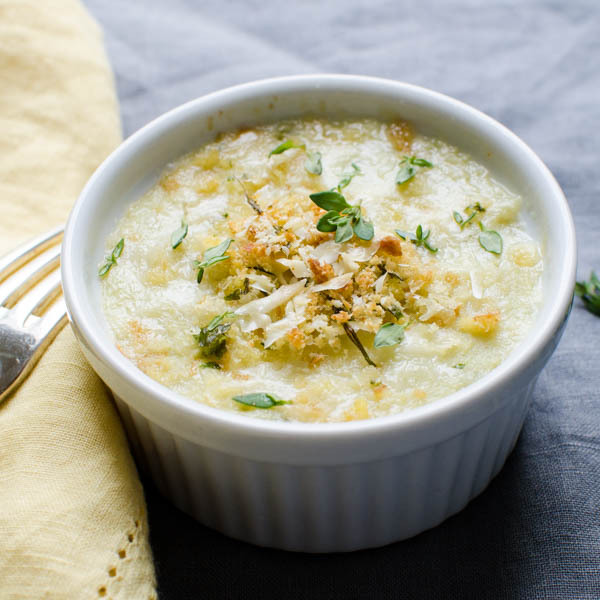 Sweet potatoes, apples and bacon, nestled in a herb-infused custard with nutty gruyere cheese. 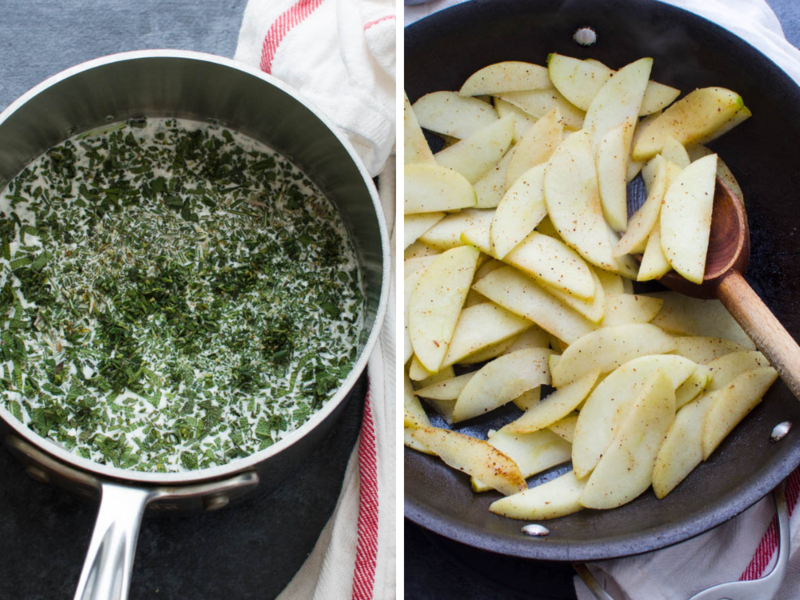 In a medium skillet, melt the butter over medium heat and add the sliced apples. Sprinkle with the nutmeg and cook until the apples are tender, but not soft, about 3-5 minutes. Set aside. In a medium bowl, whisk the eggs together, then in a slow steady stream, whisk in about 1/3 cup of the hot cream mixture. (This is to temper the eggs without scrambling them.) When the first 1/3 cup is fully incorporated, whisk in the remainder of the cream and herb mix until well combined. Spray a medium casserole dish with vegetable spray. Layer 1/3 of the sweet potatoes in the bottom of the dish, overlapping each other. Sprinkle half of the apples over the sweet potatoes, followed by 1/3 of the bacon, 1/3 of the cheese and 1/3 of the cream mixture. 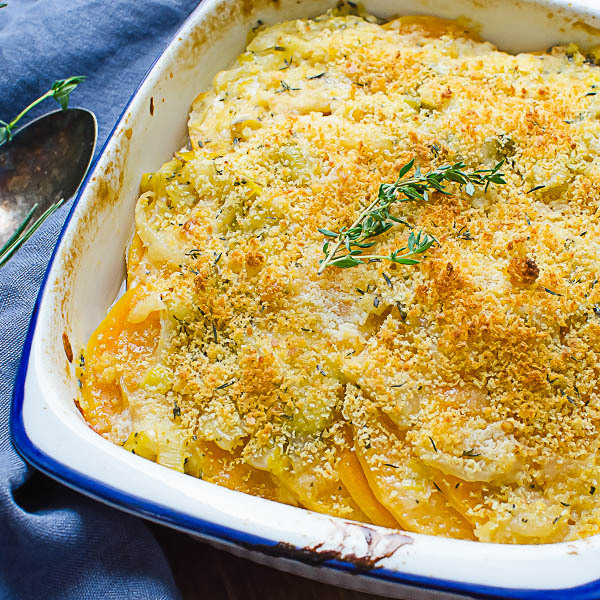 Continue in this manner with a layer of sweet potatoes, apples, bacon, cheese and cream. Finish with a final layer of potatoes, bacon, cheese and the remainder of the cream mixture. Cover tightly with tin foil and bake for 40 minutes or until potatoes are tender. Remove the foil and continue baking an additional 20-25 minutes or until golden brown and bubbly. Let rest ten minutes before serving. To bake bacon: Preheat oven to 400°. Place a baking rack over a sheet pan. Lay the bacon on top of the rack. Cook for 18-22 minutes, or until bacon is crispy. Remove from oven and set aside to cool. 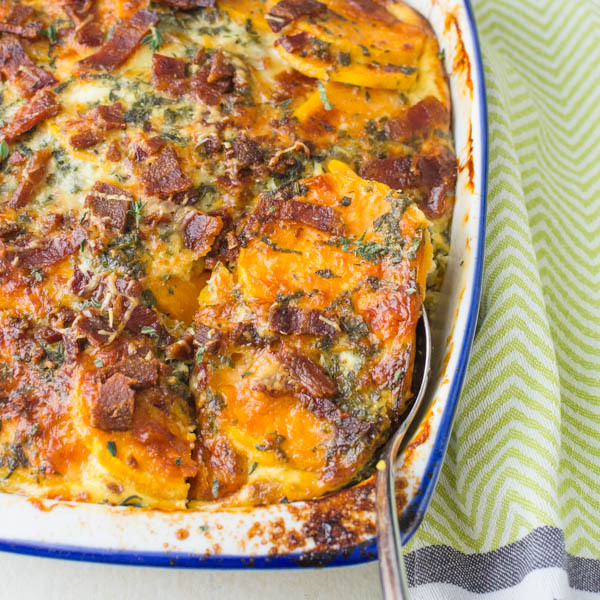 Pin “Savory Sweet Potato Casserole” For Later! There are no eggs listed in the ingredients! How many eggs are needed for this recipe? Sorry about that Melissa. 3 eggs. I’ve fixed the recipe. 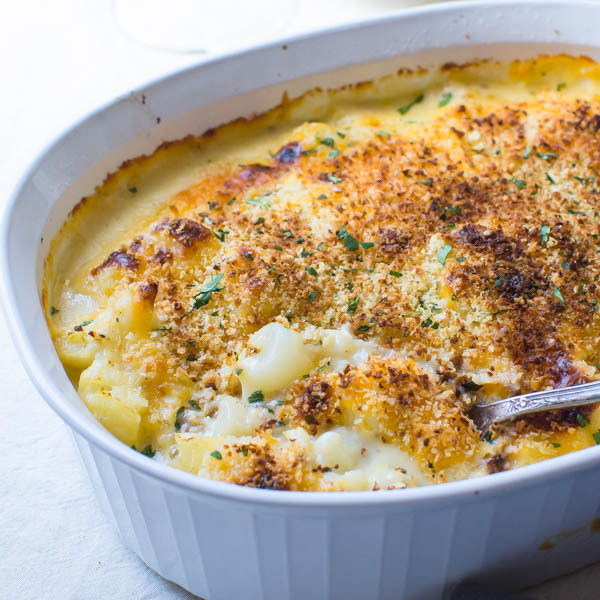 You could make and bake the whole thing ahead and just rewarm it in a low oven before serving, or you could assemble it and refrigerate the day before, then bake it off the next day… If you do the second option, let the casserole sit out for about 45 minutes before putting it into the oven. Marshmallows on hot chocolate — YES. Marshmallows on casserole — NO. Glad you like it! This looks so tasty! I’ve been trying to think of a sweet potato dish for thanksgiving that doesn’t include marshmallows, this looks perfect! I hope you and your guests enjoy it! This looks like a beautiful side dish. It is going to be my first year hosting Thanksgiving and I am gonna have to put this on my short list. 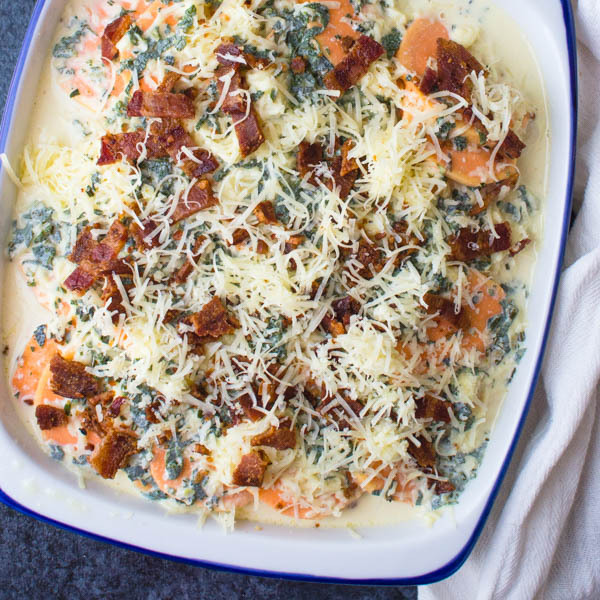 This looks like such a fun twist on the typical sweet potato casserole! I love the sweet and savory combo, so I’ll definitely have to try this over the holidays. I may just have to make this for Thanksgiving. I love the apples in with the potatoes. Looks like a great brunch dish. Yes it would. We will be having it with lamb on Christmas!